As the Sheriff of Saline County, I am honored to serve its citizens and those who visit or work in the county. 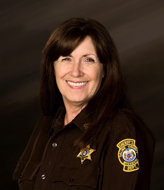 This website was designed to inform the public about the Sheriff's Department and services it provides. The mission of the Saline County Sheriff's Department is to provide professional, ethical, and responsive law enforcement services to all citizens, businesses, and guests of Saline County. The Saline County Sheriff's Department is a full-service law enforcement agency that includes patrol, investigations, warrant service, courtroom security, communications, prisoner extradition, jail, staff services, and training. If you have any questions or comments regarding the services we offer, please do not hesitate to contact the Saline County Sheriff's Department.